A leading federal law enforcement agency asked us to invent a special emergency handcuff key for their undercover operatives. The Undercover Bracelet is the result. This unique handcuff key is designed to always be situated at the optimum location for access and deployment - right next to the wrist. 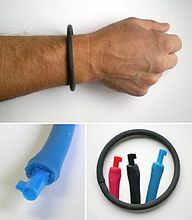 Disguised as a common "gummy bracelet", this rubbery flexible bracelet won't draw even a second glance when worn in most environments. This device is completely non-metallic, even the key portion. The key, which is permanently affixed to one end of the bracelet, serves as the connector joining the two ends. The key is not visible when the bracelet is worn. It is quickly accessed by just yanking on the bracelet, exposing the key. The key color matches the bracelet color. The bracelet accommodates wrists up to 10", and can be cut down to fit. (Larger sizes are available by special order.) Weight: 0.2 oz. Patent Pending. Made in USA.